Gorilla Shop Tools UNIVERSAL - Lesher Motorsports, Inc.
Gorilla offers a number of products to make life in a garage or shop much easier and efficient! Gorilla offers a simple, organized solution to the chaos of mixed parts and torn boxes. This 16 bin organizer is made of durable plastic and comes pre-packed with an assortment of the most popular lug nuts and washers. The set includes 30 different circle guides in both millimeters and inches. Made from durable molded plastic, the set also comes with lug centering adapters and a wheel stud gauge. 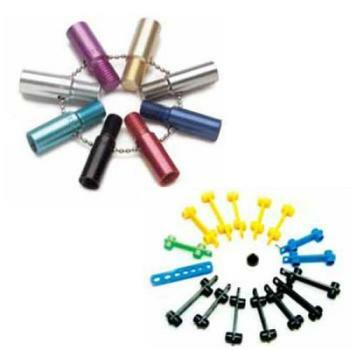 This set has both male and female threads for checking lug nuts, wheel locks and wheel studs. Eight machined gauges let you verify the most common bolt and lug thread sizes. Gorilla offers your choice of Tire Pressure Gauges that fit your customer’s needs. From the simple and quick Pencil Gauge, to the precision built dial gauges. Gorilla’s Dual Socket Spark Plug Wrench does the job of two wrenches. Designed with convenience in mind, the spring-loaded dual socket fits two sizes of spark plugs (16mm & 21mm). The dual socket also has a plug-saving neoprene insert. Super soft to clean without scratching expensive wheels. Take all the work out of removing mud, road grime, brake dust and salt from those hard to reach places. Also use it around the house or garage, whenever you need a soft brush for delicate work.